There is an opinion that Russian roads was the thing that stopped the German attack in WW2. This might be true. 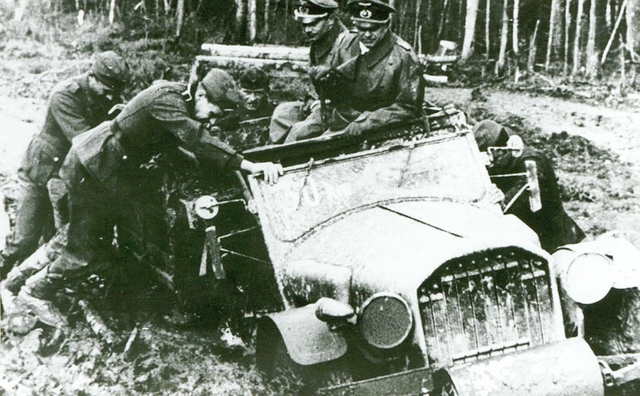 Look how hard was to advance for German Nazi troops across the Russia. This is just 100 miles from St. Petersburg. What a nice travel to Russia. Certainly germans was stoped by Russian roads and of course cold russian winter, by the way at same time on Russian side was +30C and girl in bikini serve Vodka for Russian soldiers 🙂 and of course they used highways. Actually, the roads and train tracks did act as a hinderance. Trains in Europe and Russian run on different railway gauges. I’ve actually been told by Russians, that one of the reasons Russia still doesn’t build a modern autobahn highway system, is for this very reason (poor roads would slow down any possible invasion threat). big hungry guerilla bears much better then such trucks. Actually they were. Many of the german war vehicles were built by Mercedes (trucks, tanks?, cars), VW (kubbelwagon, schwimminwagon), BMW (formerly DIXI), Maybach, and many others. It wasnt the roads that was the main problem for the germans: tanks don’t care about muddy roads, neither do halftracks (and if its too much mud they just use the fields). (the suplly-lines were different: trucks dont work with muddy tracks). But the main hindrance for the germans was the fact that the engines all froze when winter came: the lubricants used solidified so engines wouldn’t start, gun’s platforms couldn’t turn and gun mechanisms blocked.